America is heading towards 4th of July, which means celebration time. 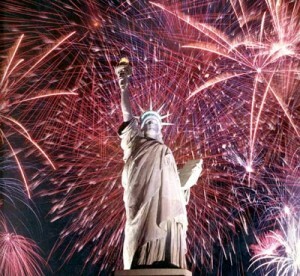 4th of July is the day that marked the freedom of America. In other terms, it the independence day of America. Usually i used to go around parties and stuff with my friends. The most memorable sight is the fireworks. Man i am dying to see it again. Any way, this time around there is huge schedule for parade,dance and party. One of the most enduring myths about Independence Day is that Congress signed the Declaration of Independence on July 4, 1776.The myth had become so firmly established that, decades after the event and nearing the end of their lives, even the elderly Thomas Jefferson and John Adams had come to believe that they and the other delegates had signed the Declaration on the fourth. Most delegates actually signed the Declaration on August 2, 1776. In a remarkable series of coincidences, both John Adams and Thomas Jefferson, two founding fathers of the United States and the only two men who signed the Declaration of Independence to become president, died on the same day: July 4, 1826, which was the United States’ 50th anniversary. Keewatin fireworks, dusk, with street dance all evening until 1 a.m.
Mt. Iron parade, 9:30 a.m.
Nashwauk fireworks, dusk, with street dance starting at 8 p.m.
Swan Lake Floatilla (Pengilly, boat parade), 10 a.m.
Ely fireworks at 10 p.m.
From THFire Admin, we wish all you folks a great great Independence. Israel does a Egypt! Stages Mass Protest!